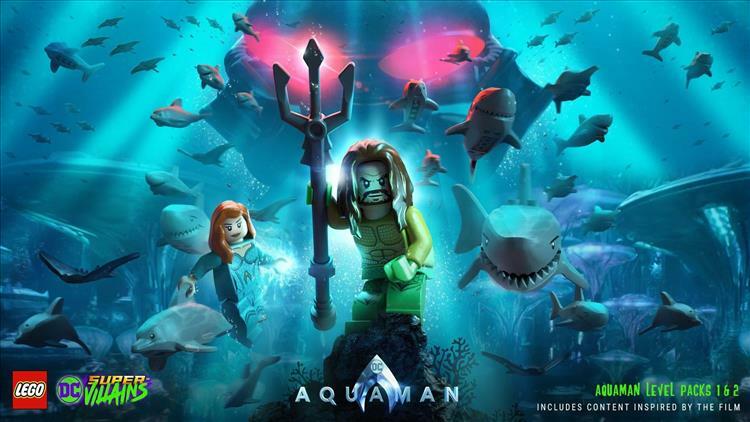 Warner Bros. Interactive Entertainment recently released the second Aquaman movie pack for LEGO® DC Super-Villains. Both movie packs offer players the chance to control a legendary pair, Aquaman and Mera, in Atlantis to defend against Orm's attempts to unite the seven kingdoms against the surface world. The Aquaman Movie Part 2 pack expands the main game's large roster (over 150 characters!) by adding new playable characters Aquaman (Movie), Vulko, Trench Creature, Murk, Brine King and Orm (Movie). The Aquaman Movie Part 1 pack adds new playable characters Aquaman (Gladiator), Black Manta (Movie), Mera, Orm (Gladiator), King Nereus and Queen Atlanna. Both packs are naturally available to Season Pass holders, but if you're an Aquaman aficionado or just watching your wallet, you can buy them in a bundle for $5.99.